Photography weather and tourist weather are polar opposites: What’s good for photography—clouds, rain, snow—isn’t usually so great for being outside. This is especially true in Yosemite, where stormy weather can add an entirely new dimension to the park’s already renowned scenery (not to mention inclement weather’s crowd-thinning effect). Sometimes Yosemite’s clouds simply diffuse the light, subduing shadows into a much more camera-friendly range, and extending the quality photography window. Other times, the clouds become subjects themselves, contorting into diaphanous curtains or towering pillars whose beauty rivals Yosemite’s granite icons. But rain or shine, there’s always something to photograph in Yosemite if you know where to look. Regardless of the forecast, I never travel to Yosemite without my rain gear duffel containing everything necessary to keep me head-to-toe dry and focused on photography: hat, gloves, parka, rain pants, and waterproof boots for me, and an umbrella for my camera. I haven’t found a satisfactory rain cover for my camera, but a plastic garbage bag is quite handy for keeping the camera dry while it’s on my tripod but I’m not shooting (searching or waiting for a shot). Another essential wet weather accessory is a towel or chamois to dry any gear (especially the front of my lens) that gets wet despite my best efforts. Some of my favorite Yosemite photography has been in the teeth of the storm, when rain or snow has forced all but the most hardy indoors, and obliterated the recognizable landmarks, forcing me to look a little closer for subjects. A bonus during these extreme weather shoots are the occasional cameos by Yosemite’s star attractions (so stay alert). My go-to mid-storm subjects in Yosemite include: the elm in Cook’s Meadow, the Cascade Creek waterfall above the bridge on Big Oak Flat Road (the road descending into Yosemite Valley from the Big Oak Flat entrance), Bridalveil Creek beneath Bridalveil Fall, Fern Spring and the Pohono Bridge, and El Capitan Bridge. But really, you’ll find shots wherever you look. As much as I enjoy photographing in stormy weather, I don’t put my camera away when skies are clear. My favorite clear sky spots are the frequently shady locations on the south side of the valley, such as Bridalveil Creek and the forest near Fern Spring and the Pohono Bridge. Depending on the season (the closer to the winter solstice, the better), these spots can offer several hours of shade at the beginning and ends of the day. Clear skies also open the door to night photography—all those popular spots that were packed with gawkers and washed out by the harsh midday light are peaceful and photogenic by moon- or starlight. My favorite moonlight (full moon) subjects are Yosemite Falls and El Capitan, because they’re the first to be illuminated by the rising moon—the face of Half Dome doesn’t get moonlight until the moon has dropped toward the western horizon, well after midnight on a full moon night. On the other hand, Half Dome does make a nice starlight subject because most views are to the east, where the sky is darkest before midnight. An unappreciated key to successful Yosemite night photography is finding a spot unsullied by headlights. Midday in the summer, when it’s virtually impossible to find shade that’s not stained with sunlight, is a good time to break for lunch, take a hike, or (especially) explore. Venture out to photograph during Yosemite’s harshest weather is the most reliable way to ensure a clearing storm opportunity. If you wait out the most miserable stuff by the fire, you risk missing the best stuff, which often happens with startling suddenness—for hours visibility might not extend beyond 100 yards, then you blink and there’s a rainbow. With its bird’s-eye view east, up Yosemite Valley, Tunnel View is the most popular location to photograph a Yosemite clearing storm, but it’s easy to be so mesmerized by the show there that you miss all the great photography elsewhere. 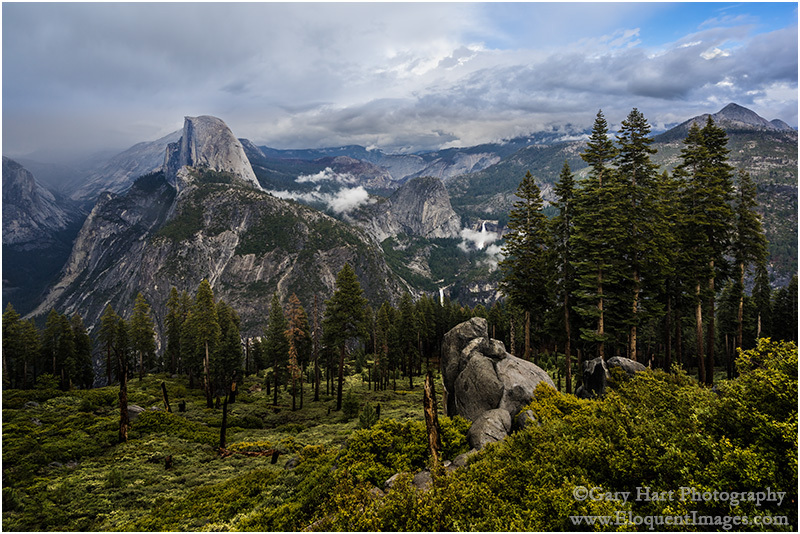 Because the west side of Yosemite Valley is where storms usually clear first, I often wait out the storm at Tunnel View, photograph its initial clearing there, then force myself to move on (believe me, it’s not easy to leave) while the shooting is still good. The best subjects for a Yosemite clearing storm are the icons—El Capitan, Bridalveil Fall, Yosemite Falls, Half Dome—but not necessarily from the standard locations. Pretty much any spot with a view of one or more of these subjects will work, but I often try to include the Merced River and reflections. Blue skies rule Yosemite’s summer, with clouds and rain the exception (but still possible). Yosemite’s wet season comes in late fall, winter, and and early spring, with rain and snow always a possibility. In general, in Yosemite Valley rain is far more common than snow, but snow can happen any month from November through April, with December, January, and February being your best bet (but some of my best snow experiences have come in November and April, and in 2015, Yosemite Valley didn’t get any significant snow until April). With its east/west orientation and primarily east-facing views, Yosemite is particularly well situated for afternoon rainbows. Tunnel View, Glacier Point, Valley View are great rainbow spots, but pretty much any valley location with a view of Half Dome, or a view of El Capitan’s west-facing wall, will work. When the sun is lower than 42 degrees above the horizon (late afternoon in the long-day months, all day in winter), look for signs of clearing in the west (where the clearing usually starts). Sometimes you’ll see a few patches of blue, other times you’ll notice that the sky is brightening slightly. Find your shadow, which will point to the rainbow’s center (if there’s no shadow, draw an imaginary line from where you guess the sun is, through your position, and toward the scene opposite the sun)—if it’s not pointing toward anything interesting, move to another location—set up your shot, cross your fingers, and wait. And don’t forget to remove your polarizer, or orient it to maximize reflections (the opposite from the standard polarizer orientation) because an improperly oriented polarizer will erase your rainbow. we’re lucky), and rarely last for more than an hour or two after the snow stops falling. So simply taking a trip to Yosemite in winter is very unlikely to net you fresh snow opportunity. In fact, even if you hear that it just snowed in Yosemite and beeline straight to the park, you’re almost surely too late. To get that coveted Yosemite winter wonderland shot, you actually need to be there during the storm. And when the snow stops (see clearing storm reference above), move as quickly as you can, because the trees will begin shedding snow almost immediately. Those of us within a reasonable driving distance of Yosemite have a distinct advantage if we’re good about monitoring the weather forecast. I look for storms with predicted snow levels below 4,000 feet, then try to arrive before the worst weather hits. Because I avoid the crowds and blue skies of summer, I don’t make it to Glacier Point as frequently as I do locations in Yosemite Valley. But a few weeks ago my brother and I went to Glacier Point to photograph lightning, then hung around until the storm cleared. Unlike the California winter storm fronts that originate in the Pacific and sweep eastward across the Central Valley and into the Sierra, summer thunderstorms are usually borne of subtropical moisture encountering High Sierra convection and billowing into towering thunderheads above the Sierra crest. In the right conditions, these thunderstorms can slip far enough west to soak Yosemite Valley and stab the rim with jagged lightning. At its most intense, the storm that afternoon nearly obscured Half Dome, completely drenching us. With the rain came lightning that soon chased us to the safety of the car. When things calmed we ventured back out to the vista to photograph the storm’s clearing. I can’t tell you how much fun it is to watch the shifting clouds that seem to create an entirely different image with each passing minute. For the this shot I waited for the cloud to part enough to reveal Nevada (above) and Vernal Falls, going wide to frame them with Half Dome on the left, and Mt. Starr King on the right. Stunning,Gary! As always your images and writing inspire and motivate me. Thanks for all the tips on timing and location. WOW!! I really love your photographic art and your very helpful narrative! My God I hope you realise how damn lucky you are to live so close to such an amazing place. Clearly from the number and variety of shots you take advantage of it frequently – I loved Wonderland BTW. This place is on my bucket list and one day, hopefully, one day. Its a long way from NZ! Tipple WOW! Weather adds so much drama and tells a story. Gorgeous! I’m visiting Yosemite for the first time next week, any advice/must sees? Thanks, Emily. Summer is crowded. The best way to avoid the crowds is to get out by sunrise. That should give you a couple of hours of relative peace. I have some location suggestions at http://www.photographyosemite.com.